The IRS is understandably interested in improving compliance, particularly because the household workers are typically low income workers who are being deprived of both Social Security credits and the protections of unemployment insurance. Education: Nannies are employees and they should be paid as such. This means that employers must understand that these people are not casual help that can be paid under the table. They are considered employees in the eyes of the law and have rights and benefits and they are entitled to these, just as any employee should be. The IRS should consider Public Service Announcement type of educational outreach to educate both the employers and the household employees. Publication: Household employers are required to file Schedule H every year with their individual income tax reports, which will remit and report federal payroll tax for their employees. However, many household employers are simply unaware of the responsibilities they have in this role and what risks and penalties come with not paying nanny taxes. The research team proposes that publications, particularly IRS Publication 926, should updated and streamlined to educate household employers on the importance of their household employee’s roles and urge them to comply with federal and state tax rules. Enforcement: Inadequate enforcement has played a role in the woeful compliance rate. Tax letter audits utilizing key metrics (two income families with children in the household and no child care expenses claimed for example) can help detect non-compliance of the nanny tax, but research teams propose that the IRS work to identify ways to help clear up misconceptions and figure out ways how to make nanny tax compliance easier. In tandem with this, the team proposes the IRS should work to educate household employers on their role, as well as their employee’s rights. 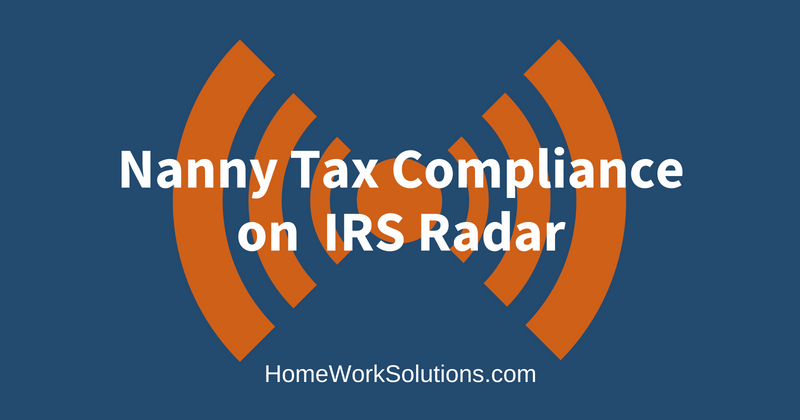 Creating an enforcement strategy that can be likened to large business compliance campaigns could be helpful in identifying those that do not comply with nanny taxes and get them on board in filing the appropriate paperwork. A household employer has a responsibility to understand their obligations under tax law, and nanny tax compliance is one of the most important things to stay on top of. If you are confused by the various federal and state tax mandates, contact our team at HomeWork Solutions today at 800-626-4829 or visit the HWS Knowledge Center for more nanny payroll information. We can help get your questions answered and will get you set up for future tax compliance, so you will not need to worry about a thing when tax season rolls around.